Francine Kelly was executive director of Featherstone Center for the Arts from 2003-2010. Francine Kelly, former executive director of Featherstone Center for the Arts, died Sunday in Los Angeles at her daughter’s home. She was 77. Her death was confirmed on Monday by her daughter Ann Smith. Ms. Kelly served as executive director of Featherstone from 2003 to 2010, presiding over a period of exciting growth for the organization by expanding programming and fundraising efforts. In 2010, her daughter Ann Smith succeeded her. Last summer, the mother-daughter team received the Creative Living Award given by the Permanent Endowment Fund in recognition of their work to promote the arts on Martha’s Vineyard. Ms. Kelly also received the Martha’s Vineyard Medal in 2011, given annually by the Martha’s Vineyard Museum. “I never thought when I came here when I was 11 that I would be receiving this honor,” Ms. Kelly said at the museum’s event, referring to how she had first visited the Vineyard when she was 11 years old. She spoke of her work involving young people in Featherstone’s activities and of her numerous collaborations with various Island organizations, including the museum. “We even had a birthday party for Pete Seeger,” she added. As a child, Ms. Kelly spent summers on the Vineyard and she retired to the Island in 2003. But watching from the sidelines was not her way. After seeing an advertisement for a position at Featherstone she immediately started working again. A graduate of Oberlin College, she began her arts career as a docent at the Indianapolis Museum of Art, and served on the boards of the Indianapolis Art Center, Young Audiences and Very Special Arts. For more than 20 years, she directed programs at the Children’s Museum of Indianapolis, the world’s largest children’s museum. She later became the director of Community Initiatives, working to revitalize the museum’s neighborhood and partnering with its surrounding businesses. There will be a celebration of life later this summer at Featherstone. 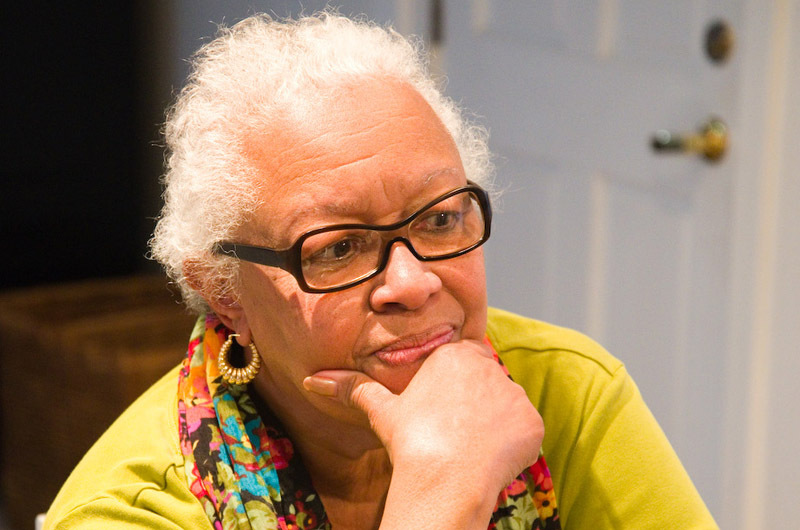 In lieu of flowers, donations can be made in her name to Featherstone Center for the Arts. I am deeply saddened at the transition of this lovely lady who I admired and loved. My heartfelt and sincere condolences to her family. This is a terrible loss of someone who gave so much to the arts on Marthas Vineyard. A sweet, gentle, smart woman was Francine, with a great sense of humor. She made Featherstone a significant place for teaching, cultural events and communal interaction. It is now in good hands for the future with her daughter, Ann, who continues the work and forward thinking of this important organization. I was so sad to read of Francine's passing. I enjoyed working with her for many years at the Children's Museum and admired her dedication to the museum's neighborhood. It was such fun to see Martha's Vineyard for the first time with Francine as a tour guide. So very sad to hear this news. The legacy Francine leaves behind via her vast contributions and lovely family shall enable us to continue to feel her presence on the island. She was a remarkable woman who will be sorely missed. Condolences to the family...we are all fortunate to have had Francine touch our lives so indelibly. Her legacy is another reason the Vineyard is special!Equality and opportunity for all! She will be remembered! Dear, dear Frances. Your name will be forever connected to Featherstone. I have missed, and will continue to miss, your kind words and welcoming smile. God bless you. Francine was a lovely, warm professional woman who will be greatly missed! Love to Ann. I'll remember Francine as a lovely, warm and wise friend who left us too early. Best to Ann. Francine gave me my very first solo show and the confidence I needed to pursue art as a career. She was a huge part of the art community on Martha's Vineyard and my young life. Rest in peace Francine. So very sad to hear of Francine's passing. I worked at The Children's Museum for decades while Francine was there too. She was always such a powerful model of womanhood at its best, of compassion, of action, of standing up for the principled and the good. She clearly carried this with her after her move to Martha's Vineyard. Blessings Francine as you journey on in your life experience out of our sight. We witness and grieve the passing of a Vineyard force. Francine was Featherstone. She has played worthy role in the life of the island and earned a place in our hearts. I have known Francine for Years. When she first came to Featherstone, I was on the Advisory Board. I enjoyed talking to Francine and loved her calmness and ability to listen to everyone. Francine and Mrs. Virginia Besse asked me to exhibit my work and I did for the first time in the stable. That jump started my career. Then I was asked to a Board Member and over the years I saw Featherstone grow from a few buildings to an art center where artists, islanders, children those who loved the arts could gather. It was Francine who made the dream of Featherstone a reality. I will miss her but her memory will live on in Featherstone and to all the people who came in contact with her. I know that if Peter had learned of Francine's passing, he would have been heart-broken. Francine was one of the great leaders of the Children's Museun of Indianapolis and Peter admired her greatly. Her work and talent formed the foundation of many young people's lives and achievements. I hope the two of them now are sharing laughs and ideas. I was one of those young people who Francine encouraged so generously! I wished I'd gotten to say "thank you" one more time. What a wonderful woman. I admired Francine Kelly the first time I met her. Her spirit and enthusiasm for reaching people through art is unmatched. Yes, she is Featherstone and she is ours. Francine gave us Ann who now carries the mantle, and is continuing to make creative connections. What a story of ageless-ness, commitment, shining example, and inspiration. Your life is memorable and meaningful. Rest now. Your work is complete. Francine Kelly was a truly loving and giving person I was blessed to meet and work with her at The Worlds Largest Children's Museum. 1980-2003 Programs Education Department. Working with her truly changed my life she challenged me to use my skills as a rap artist to educate and motivate the youth involved in the programs at The Children's Museum Francine was Mentor,Teacher,Friend who will truly be missed. William Thompson (T) as she often called me. There is a giant hole in my heart. Some of my fondest memories are times spent with Francine. For years we walked every morning ...I can see her climbing over what was left of Washington Boulevard after a tornado had torn it up. I will miss her witty and , sometimes, caustic humor. She was such fun. She epitomized grace. To the smith ladies....I will miss your mother very much...she was my sister with a different mother...May she rest at peace. Francine is survived by Ann's twin sister Janis and her Daughter Anna of New Jersey. Daughter Gwen and her son River of New York, and daughter Jill and her 3 sons Jonathan, Jackson, and Jules of Los Angeles where Francine passed away peacefully after battling illness. I am saddened beyond measure about the passing of such a giving and wonderfully talented lady, a true Vineyard icon. I have been blessed to have known her daughters (Jan, Ann and Gwen) since we were teens, and consider them family. At this difficult time, as we mourn the passing of Ms. Kelly, I pray that her family's grief is assuaged by the blessed memories of her doing what she loved to do, at Featherstone and beyond, while enjoying our beloved Vineyard and adding an indelible and colorful patch to our Vineyard quilt. I worked with Francine for years at The Children's Museum. One of the many things I remember about Francine was her hands. I use to love to watch her hands. She had the most beautiful hands and they were such an expression of the inner Francine. They were graceful, strong, expressive. They moved slowly but with determination and purpose. Farewell dear Francine. I will miss my dear friend of more the 40 years. She taught me so much over the years. She introduced my family to the Vineyard. I'll miss our yearly visits with her on the Island. The laughter, great dinners with lots of vine, touring around the Island and just quiet moments watching a great view together will be missed. To my Goddaughters, Big Hugs. The wonderful life lessons she taught you will sustain you during this difficult time. God Speed old friend! My thoughts and prayers are with you Ann and family. I am truly sorry to hear of Francine's death. Working with her many years ago was a delight. I will always remember her as a kind and caring person. I am so devastated and sorry to hear of Francine's passing. I learned so much from her during the 11 years I managed the Lilly Theater at The Children's Museum of Indianapolis, under her leadership of the programs department. She was a true friend and mentor to me, and she was one of the most dynamic and dear people I have ever known. Indeed this is a loss of major proportion. I worked with Francine at The Children's Museum in the late 1980s and am honored to have done so. She was witty, generous, involved and responsive to even a simple secretary's input. Rest easy, Francine. Deeply saddened by the loss of an old friend. We are remembering the many, many good times shared with the kids. Though life can separate us, memories linger and that's a good thing. Ann, I'm so sorry to hear!!! Your mom has often been in my thoughts and always in my heart from the time we worked at TCM. While she was an amazing leader at the Children's Museum, the aspects I appreciated were her pride in her daughters (her heart often swelling when telling what you each were doing), her excitement at taking on new tasks (including purchasing the house on Washington Blvd and making it her own), her combination of gentleness yet straight-forwardness, and her drive to make a difference. She will be missed, but always remembered.